Ein Stein Wine House acquires its wine juice and concentrates from RJS Craft Winemaking. RJ Spagnols visits the world’s leading wine regions, and selects the very best grapes for our juice and concentrates. Their Research and Development team crafts our distinctive wine kits with the perfect blend of varietals. During our wine making process, we use these specially crafted blends to make superior tasting wines for you to enjoy and feel proud to share with your family and friends. At Ein Stein Wine House, we can tell you where our wine comes from. We can tell you from what country, region, and even vineyard, the wine comes from. For additional information, you can visit www.rjscraftwinemaking.com. How do I decide what wine I want to make? 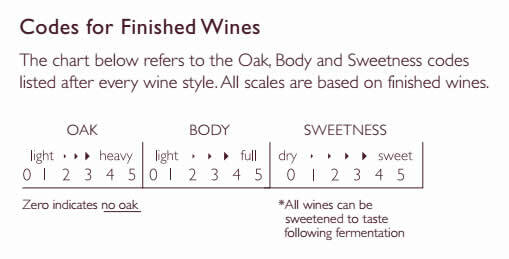 The chart below refers to the Oak, Body, and Sweetness* codes listed after every wine style. Our wine list includes this legend to help you make a decision on what wine to make. In addition to levels of Oak, Body, and Sweetness, you also need to consider the amount of aging you want to apply to your wine. Our wines are made in 4 weeks or 8 weeks. 8 week wines are more expensive than 4 week wines. *All of our wines come unsweetened, and can be sweetened with your personal preference.